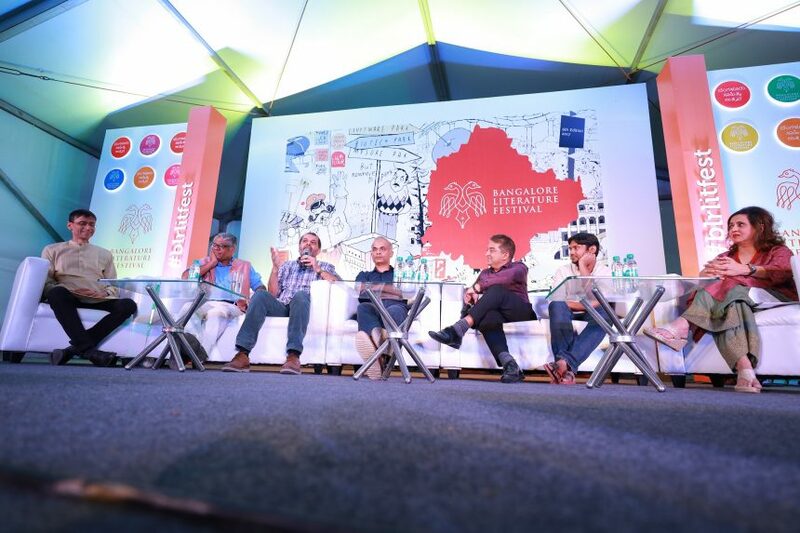 6pm on 29th October | 2nd Day of the Bangalore Literature Festival – connoisseurs of literature moved through different directions; some took the left, another set walked from the right, and a few had to take the centre (political correctness?). Notwithstanding the route wished, granted, or taken, the feet of democracy converged at ‘Speak Up’ venue of the Bangalore Literature Festival to register their attendance for the numero-uno on the best-selling sessions list of the day titled ‘Nationalism, Populism and the Threat to the Global Liberal Order’. Harish Bijoor in the role of moderator sounded determined to create a monumental heap of questions to warm up the evening. “Are there subplots to Nationalism? What is Sub-Nationalism? Whether there is a Left agenda and a Right agenda attached to Nationalism? Why has ‘Liberal’ become a bad word in itself?” – such were the opening thoughts of the moderator. Professor Makarand Paranjape wanted to look at the subject from the point of view of cultural and practical relevance. He pointed out the problem in framing of issues. Paranjape said that he stood for neither the right nor the left but for an intermediary hermeneutics. The debates we are having today have come from Europe in an extremely muddled and muddied form to India. Paranjape suggested that instead of having a Left Vs. Right debate, the question should concern integrity and its lack thereof. Expounding on the failure of liberalism, he said that we lacked integrity and haven’t been able to fulfill the ‘Dharma of Liberalism’. Manu Joseph pitched in with his experience with a Zimbabwean landlady who was hosting him in Harare. At the time, President Robert Mugabe was driving out the white landlords and the lady was convinced that even the black population hated Mugabe. As it turned out, that was not the case, and her maids in the house told her to her disbelief that they liked him because he was for them. Manu said that when it came to choose between the politicians and the elite, his Indian experience told him that people hated the elite more than the politicians. Manu also narrated his encounter with Praveen Togadia who didn’t let him enter his house because he was a christian. Bringing in the question of language, Manu said that he was laughed at by Togadia for his poor Hindi and in response, Manu asked him his next 3 questions in Malayalam at which Togadia started giggling. Manu had asked Togadia then whether he was a nationalist or a North-Indian nationalist. According to Manu, both nationalism and populism are forms of activism and activism breeds feudalism and the liberals weren’t without a blemish there. The moderator moved to Kanhaiya Kumar. He chiefly spoke in Hindi and stressed upon the absence of imposition of one’s own language as nationalism. “Tolerance for the opposing views must be the most important feature of nationalism.”, he added. In response to Jagannathan, he quipped, “…the system in addition to polio drops should now vaccinate people in nationalism too. For Kanhaiya, the Indian Constitution and its preamble that starts with the phrase ‘We, the people of India’ underlined the idea of nationalism. Kanhaiya also attacked the government for its failures and said that the entire nationalism debate was a tool to hide those failures. Kanhaiya spoke on the need of values and expressed concern on the devaluation of the left, the right, and the centre all alike. The last speaker to join the debate was Sagarika Ghose who claimed that she was only a journalist and had no business with ideological camps. Ghose said, “These terms like nationalism, liberalism have been caricatured in India and have placed labels on us. That shouldn’t be the case.” She expressed her disagreement with Jagannathan’s views and said that the idea of nationalism wasn’t exactly a benevolent one. “The two world wars were fought on the idea of nationalism, the Fascist movement in Germany was a form of far-right nationalism. Even America that used to be an exemplary case of liberal democracy has lost its way. These signs are worrying. Present national debate in India keeps looking for an enemy and hence we have all these epithets like libtards etc.” Sagarika said. She also emphasized the need of going back to Gandhian nationalism where we hated the British imperialism but there was no need to hate the British. After the opening remarks from each of the panelists, the debate took a more open and argumentative turn with exchanges that ranged from minority appeasement, selective liberalism, failure of liberals at being liberal, redemption of the ignored, and the politics of such debates themselves. Suketu mentioned that he had often seen the panelists being warm to each other before and after the debate but ready to kill once the camera was on. On the question of populism, Paranjape said that democracy was invariably linked to populism, elections were won on populism, and every party thrived on populism. Bringing Mao and Stalin into the debate, he added to his point on selective liberalism and how authoritarian powers had risen on all sides of the political spectrum. “Even the Nazis called themselves Nazi Socialists.”, Paranjape retorted to Sagarika’s linking of nationalism and the Nazi Germany. The audience remained spellbound and dispersed only when the stage had none of the luminaries left on it. I’m sure they went back with a lot to reflect upon. However, owing to the nature of the debate, it served well that Amaan and Ayaan Ali Bangash with Vijay Ghate piedpiped the attendance at the Bangalore Literature Festival to an immersive evening of Sarod to mark the beginning of a year long anticipation and preparation for the Bangalore Literature Festival 2018.